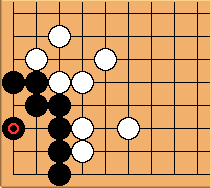 If black has two or fewer outside liberties, which is likely given the shape, then can turn this shape into a throw-in ko or a seki. With more outside liberties, Black can limit White to semedori. If white takes the vital point with , Black's best response is at (but see later what happens if black plays B2 at W3). After , Black will not want to play at b because this move reduces the eyeshape to a pyramid four, thus killing the group in gote. Playing at either c or d is also bad, as White would reduce the eyeshape to a bent four in the corner via a move at a. Playing at a, which turns the position into a ten thousand year ko. If Black plays elsewhere, White has two choices for playing locally: making a seki with a, or playing the approach move at either c or d to prepare for a throw-in ko. When neither side has enough ko threats, the simplest variation for White after Black plays elsewhere is to make a seki with . However, because this move is not urgent and removes the possibility for a ko (see aji keshi), White should normally wait until the end of the game to play it. If White has more ko threats than Black does, White may capture the corner via a throw-in ko. However, it requires one extra ko threat and allows Black to play two additional moves elsewhere relative to the seki variation shown above. Whether this exchange is worth the cost would depend on the rest of the board. If the trade is not profitable to White, it is usually better to leave the position alone after as shown earlier and wait until later to decide whether to start a ko or to make a seki. If Black plays as shown, White will most likely play elsewhere or capture the ko by playing at b. White may make a seki at any time by connecting at . As in the case Variation #1, this is more likely to occur if neither side has enough ko threats. If White has one more ko threat than Black does, the corner can be captured. As in the case of Variation #2, White only needs one more ko threat than Black does to win the ko. If White is komaster, White can wait until the endgame to start the throw-in ko. 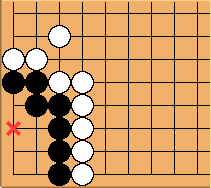 By then, Black would gain very little in exchange for the corner through the extra move elsewhere. If the ko is fightable for Black, White could simply choose the seki variation to deny Black the chance to live with points. If Black wishes to delay White's timing for making a seki and possibly live with points in the corner, making the ten-thousand-year ko is the only way to do so. 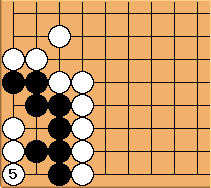 If Black has two more large ko threats than White does, this variation may be played to live with points in the corner. However, White will get two moves elsewhere in the exchange. Since Black has much less to gain from settling the corner immediately than White does, this exchange is unlikely to be profitable in most situations. Therefore, Black would most likely wait until the endgame before committing to playing out the sequence starting with even if he does have enough large ko threats. This way the position becomes a direct ko, which is an inferior result for Black because he will get less compensation in exchange for the corner if he loses the ko (two moves elsewhere, compared to 3 or 4 in the above-mentioned variations). White can finish the ko by filling at ; it would be a mistake to play one of the other inside liberties instead. Although the situation shown here is perhaps unlikely to occur in real games, it is of theoretical importance. If Black's group has three or more external liberties, White can only cause semedori, as Black can set up an oshitsubushi as shown at the end of this section. Black-to-move plays the same as without outside liberties, and White-to-move plays on the same intersection. If Black ignores , then White kills outright with . Black chooses between and . makes the corner a direct ko: Black can win it with , and White can take it as in the "Variation for B​2" section. The rest of this section assumes that - has already been played. Now, is the vital point. Black playing there is a 1-point reverse sente that makes Black Benson-alive with 6 points under territory scoring. Accordingly, the rest of this section assumes that White already played there. If Black might ignore the filling of an outside liberty then Black having played might be worse for Black than having passed. However, Black should not play anywhere else inside the corner, so the rest of this section assumes that Black already played . Black will eventually need to add 2 more moves in the corner, since otherwise, after the outside liberties are filled, White could take and fill the ko for seki. 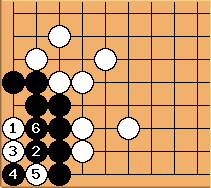 In fact, the next 2 times White fills an outside liberty, White will be threatening a ko to kill. Three liberties is enough for Black to crush the ko. Notice that without the last of those liberties, would be auto-atari.